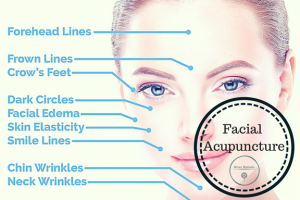 Facial Acupuncture, also known as Facial Rejuvenation, is a natural, non-surgical treatment that can give you more radiant looking skin, a reduction of fine lines through increased collagen production and improved facial muscle tone. Facial Acupuncture dates back thousands of year and is a more natural approach to anti-ageing. It offers a safe, holistic alternative to some more invasive anti-ageing procedures. Small acupuncture needles are placed in facial acupuncture points to stimulate the movement of Qi and tiny intra-dermal needles are placed along the lines of the face to stimulate the production of collagen and elastin to improve their appearance. Not only can the treatment improve the appearance of the skin but we use acupuncture points during the treatment to improve overall health and wellbeing. The beneficial effects of acupuncture are cumulative- meaning the more treatments you receive, the greater the impact on the appearance of your skin. A once off treatment can be good. However, for best long term results, a course of 10 treatments are recommended over a period of 5-10 weeks.